Joaquin Phoenix's recent film Her is sitting at a 94% fresh rating on Rotten Tomatoes, but the enigmatic actor refuses to let that stop him from maintaining any sort of good will with the people. Phoenix was recently spotted performing on a New York City night club stage in unkempt rap persona mode much to the dismay of the large crowd. 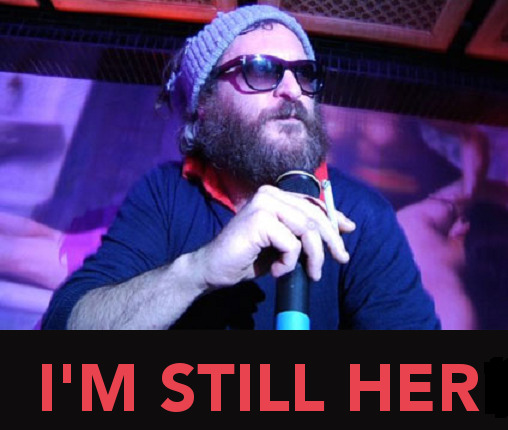 Joaquin managed just a few dope lyrics before quickly being ushered off stage by a club bouncer. "I'M STILL A RAP-PER.......MY MOVIE IS CALLED HER......GO SEE IT RIGHT NOW.....IT'S GONNA WIN THE OSK-ER!" Could he be setting the stage for a potential I'm Still Here sequel? We'll just have to wait with bated breath to find out if Phoenix's rap career will rise from the ashes again.